France opened their 2011 FIBA Europe U18 European championship competition with a victory against the Slovak Republic (55-32) with 11 players getting on the score sheet. However before France could play their match, Belgium opened the competition with an emphatic victory against Ukraine (87-60). Ukraine turned the ball over 42 times and conceded 24 points from these turnovers. Emma Meesseman from Belgium had a good game hitting 8-of-13 from the field and scoring 7-of-9 free throws for a game high 23 points. She also recorded the first double-double of the competition with 11 steals. Sien Devliegher and Julie Vanloo (6 assists) also finished in double digits with 14 and 13 points each. France led from start to finish in their opening game victory against the Slovak Republic (55-32). Margaux Galliou-Loko (left) was the only player in double digits with 10 points while Lola De Angelis (9 rebounds) and Jodie Cornelie followed up with 10 points. Olivia Epoupa was also on fine form for France with 7 points and 7 rebounds. The Slovak Republic have not come with many players who played at the U20 Championship last month. They were led by Angelika Slamová who scored 10 points. Michaela Raková led the rebound count with 10 but just scored 2 points. The match itself started slowly and after a nervous opening from both teams Lola De Angelis opened the scoring with a long distance three-pointer from her favourite position at 45° to score the first points of the game. France were not playing brilliantly but dominated all sectors of the game to open a (12-3) lead by the end of the first quarter. France continued to control the game and pushed the advantage into double digits with the first points of the second quarter from Jodie Cornelie. France continued the offensive action. Midway through the quarter the Slovak Republic's head caoch Martin Pospisil called a time-out with his side trailing (7-21). A change to zone put a halt to the French attack for a moment. The Slovak Republic scored 5 quick points with a trey by Barbora Bálintová and a transition lay-up from Dominika Rusináková. Esther Moisan Niamke put an end to the Slovak Republic's challenge as France found a solution to beat the Slovakian defense. France still ended the first half on a high with De Angelis hitting her second trey of the game from almost the same spot as her last for France to go into the locker room ahead (28-16). The second half of the match was more balanced. But France were always in control and never in danger of losing, which gave the coaching staff an opportunity to play everybody. 11 players got on the score sheet as France cruised to victory. In Group C Serbia beat Italy (64-53) despite 14 points coming from Erica Reggiani from Italy. Francesca Dotto was in Chile at the U19 FIBA World Championship earlier in the week and contributed 12 points in defeat. Serbia got off to a good start winning the first quarter (17-9). They then paced themselves the rest of the way with Natasa Kovacevic leading the way with 17 points while Ivana Brajkovic helped herself to a double-double of 13 points and 13 rebounds. Serbia meet Belgium next in a match that determines the group leaders. In Group D the Netherlands have come to this championship with four players who played in the U20 championship last month. The Netherlands left it late in overcoming the Czech Republic (81-69). But once Loyce Bettonvil got going in the final quarter with 11 of her team's final 21 points, there was nothing the Czech Republic could do. Bettonvil led the Dutch attack with 20 points. The Dutch meet the Slovak Republic next, while France play the Czech Republic. Swedish youth teams over the years have taken teams to the wire and come out on top. Turkey appeared to have the upper hand by going 5 points clear with just over 90 seconds to play (63-58). However Amanda Zahui from Sweden had not given the game up and with back to back scores pulled Sweden back on level terms (64-64) with about 30 seconds left to play. Turkey started to panic and Ellen Nystrom managed to get herself a couple of free throws which she calmly scored with about 14 seconds left to play. Turkey then messed up the last attack by turning the ball over, leaving the victory for Sweden. 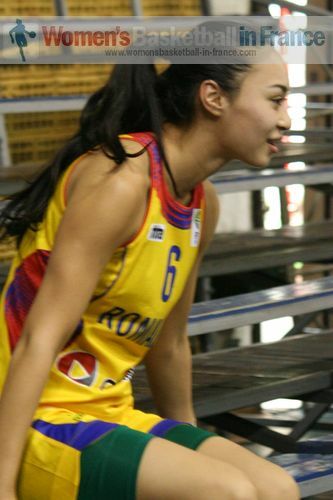 Romania pulled of the win of the day in beating Russia (52-50). For Russia Ksenia Tikhonenko - who was at the World Championship - led the way with 12 points and 10 rebounds. But the hero of the day was Sonia Ursu (left) from Romania with 20 points, 3 assists and 8 steals. Russia were leading (40-35) going into the final quarter. Yet with Ursu and Oana Baluta sparking an 11-0 run for the hosts Romania turned the game upside down. Ursu put the hosts in the lead for good from the free-throw line with seven minutes to play. In Group B Lithuania were pushed all the way by Poland. They were thankful of Ieva Preskienyte's double-double 12 points and 19 rebounds as they held held off a late surge by Poland to win (61-58). Spain blew away Slovenia in the first half (43-15) and then relaxed in the second half while keeping control to win (43-15). Astou Barro Ndour Gueye (Astour Ndour), who was also in Chile for the FIBA U19 World Championship for Women led the Spanish attack with 13 points in 16 minutes playtime.